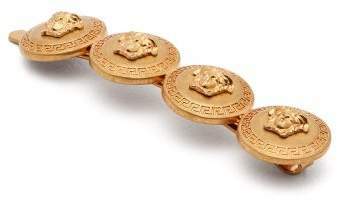 Versace - Crafted in Italy from brushed gold-tone metal, Versace's hair slide is lightweight yet firmly structured to keep locks pinned in place. It features a quad of coin pendants each bearing the house's hallmark Medusa head, encircled with a geometric pattern. 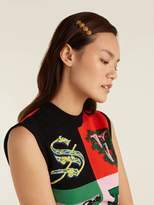 Wear it to accessorise a simple hairstyle along with the label's bold intarsia knitwear.